End Britain's role in a war against Yemen which is killing 130 children every day. From the moment Saudi Arabia started bombing and blockading Yemen in March 2015, Britain has been deeply complicit. At the time, foreign secretary Philip Hammond defined British policy as one of support for the assault “in every practical way short of engaging in combat”. Since then, Britain has sold almost £6billion worth of weapons to Saudi Arabia. British bombs, dropped from British planes by British-trained pilots, have targeted funerals, markets, and hospitals, killing and mutilating tens of thousands. Worse, the country – which is reliant on imports for over 85% of its food, fuel and medicines – has been the victim of a devastating blockade. The country’s main port, Hodeidah, and its airport in Sanaa, have been repeatedly targeted, with ships containing desperately needed supplies arbitrarily held up for months on end or turned back altogether. This vicious blockade has led directly to a humanitarian crisis in which one child contracts cholera every 35 seconds, and 130 children die of starvation and preventable diseases every day. To date, almost 1 million Yemenis – more than 1 in 30 – have contracted cholera, making it the biggest outbreak of the disease since records began in 1949. 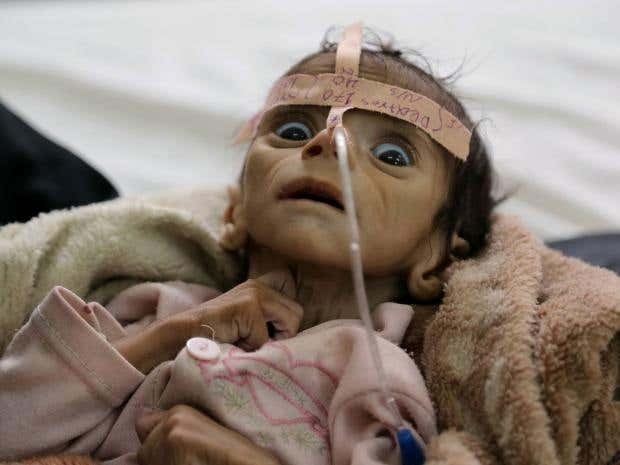 According to Save the Children, 50,000 Yemeni children have now died from starvation and preventable diseases in 2017. As of 1st December 2017, only a small trickle of aid has been allowed into the country. The world’s aid agencies now warn of a massive famine, dwarfing anything the world has seen for decades, threatening to wipe out 7 million people (one quarter of the population). And yet, true to Hammond’s words, British support for this sickening enterprise has been unwavering. Britain continues to give full political, diplomatic and military support to the war, providing technical and logistical assistance to the Saudi airforce, regularly blocking the UN’s attempts to investigate war crimes, and providing all the materiel necessary for the continuation of the war. The establishment of and full cooperation with, an independent UN investigation into the role played by Britain in the war and blockade against Yemen, including: a) the role of the 150 Brits deployed with the Saudi military and b) the secret deployment of HMS Daring off the shores of Yemen in November 2016. All members of the British government for the period of British involvement in the Yemeni war must face justice, preferably through an independent court or tribunal (over which Britain and its allies have no influence). Britain and its allies must pay full reparations to Yemen for all the damage they have caused, including compensation for injury and destruction of property; healthcare and pensions for the wounded and their families; trauma counselling, etc.